Companies that locate in Houston expect to take advantage of a bustling business environment and work with major players in just about every business sector. 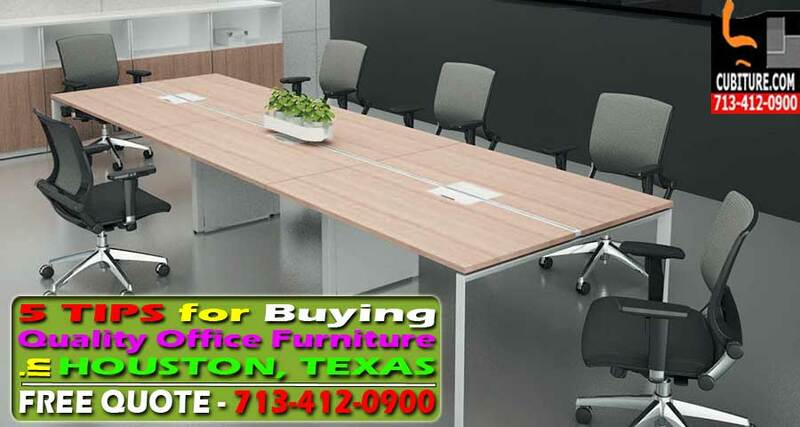 When it comes to buying office furniture Houston business owners and managers don’t want to compromise. Your choice in office furnishings reflects your business’s values and can positively affect productivity. If your Houston-area business needs office furniture, you may feel overwhelmed by the task. But if you follow a few important guidelines, you can spend wisely, and most importantly, make an investment that will serve your business well. When selecting office furniture Houston businesses should keep these 5 tips in mind. Understanding the physical dimensions you’re working with is your first step. Measure all dimensions carefully, or get dimensions off the blueprints for your office. Check the width of all hallways and doorways, and make note of the number and locations of electrical outlets, phone jacks, and other infrastructure. Note the presence of things like support beams that may be installed in large open spaces, how many there are, and how far apart they are. Some providers of office furniture in Houston offer space planning as a free service, to help you choose products that will fit comfortably. Cubicles do not have to be boring and generic. When buying office furniture Houston businesses have a huge range of choices in fabrics, colors, and designs to help them set exactly the right aesthetic tone. Some companies select office furniture that reflects company logo and advertising colors, while others choose aesthetic features based on the style of building they’re in, the characteristics of the workforce, or the type of work they do. You’ll want to balance privacy and interoffice communication by choosing cubicle wall panel height carefully, taking into consideration whether business operations require more privacy or easy communication among employees. Office layout should reflect the flow of operations. Some staff members may need to be clustered together, and equipment should be located to facilitate access of those who use it most. For offices where workers spend most of their time sitting at their desks, the ability to adjust desk and office chair height, and height of the equipment they use most is critical to reducing the risk of repetitive strain injuries. Much office technology networking can now be done wirelessly, but if your office requires a lot of cabling, your choice of furnishings should accommodate it to prevent safety and tripping hazards. Be sure office furnishings accommodate the technology your employees rely on. If your work environment dictates smaller workspaces, choosing office furniture with multiple purposes can help reduce clutter while giving employees the workspace and storage they need. Multifunction furniture pieces can also aid productivity by making supplies readily accessible and easy to organize. Determine which furniture pieces are essential, and select designs that have added functions (like storage) built-in. Even cubicle partitions are available with built-in shelving for storage of small items, or that allow you to attach things like boxes, hooks and shelving easily. Providing your office furniture for your immediate needs may seem overwhelming enough, but it’s best if you can take a longer view. Are you planning to hire more people over the next six to 12 months? If so, planning for the furniture you’ll need in the future is wise. For one thing, you can design the layout of cubicles and common spaces so that the new workers will be more easily accommodated. For another, when you purchase all the furniture at once, you may become eligible for volume discounts. By considering the future as well as immediate needs for office furniture Houston businesses can save money and prevent some of the upheaval that comes along with expansion. Choosing the right office furniture is an investment in your company’s employees and its future, and can make a positive difference in your employees’ day-to-day work lives. By investing in the best office furniture Houston businesses show that they respect their employees and want to provide the most productive workspace. At Cubiture, we offer a broad range of choices in office furniture for Houston businesses, including new and used office furniture. We’re ready to help you evaluate your furniture needs, your office dimensions and workspace design, and your budget to find the best solution for your particular business. With versatility, experience, expertise, and enthusiasm for furnishing Houston businesses, Cubiture is your solution to providing your valued workforce with the best possible working environment.